Airing over a span of five nights during late September in 1990, Ken Burns’ “The Civil War” remains, to this day, the only documentary that claims to explain the entirety of the war that engulfed the United States in the mid-19th century. “The Civil War”’s premiere became the most-watched PBS program at the time, with the nine-episode series carrying a total running time of 11 hours, and to this day it remains one of the most popular shows ever to air on public broadcasting. Garnering scores of awards, “The Civil War” has now influenced generations of Americans and shaped their beliefs about slavery, the war itself, and its aftermath. The documentary had an outsized effect on how many Americans think about the war, but it’s one that unfortunately lead to a fundamental misunderstanding about slavery and its legacies—a failing that both undergirds and fuels the flames of racism today. Watching “The Civil War” as a teenager several years after its initial release, I became enamored with the series—so much so that I spent my hard-earned money on the expensive companion book and the soundtrack for the haunting “Ashokan Farewell”—a song from the 1980s (not the Civil War era!) that played throughout the series. In many ways, the documentary helped spur my own interest in U.S. history. Yet as I grew older reading broadly on both the war itself and the 19th-century South, enjoying scholars such as Bell Irvin Wiley, John Hope Franklin, and Victoria Bynum, I realized that I fell in love with the series—but not for its historical accuracy. Instead, it offered a kind of self-satisfaction for me as a white American, and, more importantly, as a white Southerner. I came to realize that by downplaying the importance—and horrors—of slavery, and instead concentrating on hard-fought battles, valiant, virile soldiers, and heart-wrenching tales of romantic love and loss, the documentary specifically targeted one audience: white people. While there are several difficulties with “The Civil War,” the fact remains that the entire production was written, directed and produced by white men with little in the way of historical training and few connections to academic historians. While undoubtedly masters of the mediums in which they were trained, biographer Geoffrey Ward, producer Ric Burns, and Ken Burns himself surely had blind spots and lacked the diverse perspectives necessary to convey the sheer magnitude and long-lasting impact of the war. Many professional historians immediately took issue with “The Civil War,” and their concerns were published in a 1997 volume edited by Robert Brent Toplin. Featuring essays by some of the most well-known scholars of the day, including Eric Foner and C. Vann Woodward, with responses by Ken Burns and Geoffrey Ward, Ken Burns’s The Civil War: Historians Respond did little to lessen the continuing impact – indeed, the cultural and intellectual legacy – of the film itself. It’s worth noting that filmmakers not trained as historians, like Ava DuVernay (Thirteenth) or Marlon Riggs (Ethnic Notions, Color Adjustment), have been able to produce challenging and accurate documentaries. Indeed, through lenses like theirs, the Civil War narrative would have been much more nuanced and would have encompassed of a wider set of experiences and ideas. PBS’s own highly rated Civil Rights documentary, “Eyes on the Prize,” aired in 1987, just a few years prior to “The Civil War.” Although written and directed by a variety of people, “Eyes on the Prize” was – and still is – considered good, sound history, and is still being screened in history classes across the U.S. today. But scores of other field-changing histories were overlooked by the documentarians: Eric Foner’s magnum opus Reconstruction: America’s Unfinished Revolution, 1863-1877 won the Bancroft Prize the same year Battle Cry of Freedom won the Pulitzer. Carrying on themes from W.E.B. DuBois’s Black Reconstruction in America (1935), Foner’s work opens in 1863 with the Emancipation Proclamation, and unquestionably places slavery at the center of the Civil War. In so doing he shatters the myths of the infamously pro-Lost Cause Dunning School, whose racist theories had shaped Americas historical narrative since the early 1900s. Not only did these white Southern-sympathizers eventually determine how the Civil War and Reconstruction would be taught throughout U.S. schools, they also quickly came to dominate popular culture as well, most famously in the wildly popular Birth of a Nation, D.W. Griffith’s 1915 blackface film. The problem of having an all-white, all-male (and non-historian) production team was further compounded by Burns’ choice of interviewees. Eight-and-a-half minutes into the first episode, Shelby Foote, a Mississippi-born writer with an accent as thick and sweet as Tupelo honey, made his unforgettable debut. The descendant of wealthy, slaveholding planters who fought for the Confederacy, Foote, a writer and journalist with no historical background, made the first of many appearances in which he spoke with the authority of a historian, but with none of the scholarly understanding of the war. Yet Foote was so charming and stereotypically “southern” that the Burns brothers used his interviews as the dominant narrative throughout the entirety of the film. But Foote was given the final word in the scene. Instead of slavery, he claimed, the Civil War occurred because of our “failure to compromise.” Fields would receive approximately eight-and-a-half minutes of airtime throughout the nine episodes, while Foote, whose quotes could best be described as a Confederate apologia, would be featured for an astounding 45 minutes and 56 seconds. The first mention of slavery is not until six minutes into the film, at which time it is invoked with McCullough erroneously stating that Robert E. Lee “disapproved” of slavery, a fact easily challenged by the fact that Lee fought to inherit enslaved people who his father-in-law, George Washington Parke Custis, wanted to free. Soon after, the first African-American is mentioned: a short vignette about the writer, activist and abolitionist Frederick Douglass, referred to as a “runaway boy” even though Douglass was about 20 years old when he escaped slavery. After a very cursory four-minute discussion (a full minute less than the time devoted to the Battle of the Monitor and Merrimack), slavery—and the enslaved themselves—are rarely discussed. The sins of omission in “The Civil War” unfortunately are not without consequence. Because so many Americans have had their basic understanding of the causes of secession, the realities of racial slavery, and the atrocities of the Confederacy profoundly shaped by this documentary, current day topics, from the Confederate Monument/flag debate to the push for reparations by American Descendants of Slaves, remain bitterly divisive, even though clear historical answers obviously exist. By focusing on a type of military history wherein all sides can be seen as—in some way—heroic, “The Civil War” allows us, as white Americans, to forget about the reasons why we were fighting in the first place. It allows us to focus only on an antiseptic form of history that makes us feel good, on a narrative that emotionally relieves us of sins that should not be relieved. It allows us to convince ourselves that the dishonorable were in some way honorable; it reassures our sense of selves as inculpable white Americans; it allows us a psychological pass for the sins of our forefathers. While all major projects inevitably have detractors focusing on what was left out, the film’s near silence on a range of topics—from Native Americans and campaigns in the West to labor issues and the divided South—might allow it to be called a good work of military history, but not much more than that. We desperately need a new Civil War documentary that can be seen by broad swathes of the American public. Because film is such an emotionally resonant medium, and such a wonderful means of bringing a scholarly subject to the general public, it is imperative that true experts of Civil War era and slavery studies use this medium to (re)educate the American people about our own history. Americans would greatly benefit from a new telling of the Civil War, of its causes and effects, of its soul-crushing violence and its joyful freedoms, of its heartening triumphs and abject failures. But it must be the story of ALL Americans—not just of white politicians and soldiers. Ideally this new documentary would draw on the burgeoning and innovative field of slavery studies, featuring the work of new scholars. By the end of the documentary, Ken Burns and his team made the Civil War seem almost unavoidable, and by making Americans believe in the war’s inevitability, the film allows whites a type of psychological “pass”—forgiveness for the sins of our forefathers—for both the war and its cause. By focusing on reconciliation, and by advancing a story that centered on personal stories of common soldiers, “The Civil War” provided a soothing narrative of American greatness—one that often bordered on the importunate idea of American exceptionalism. Minimizing hundreds of years of uncompensated, brutalized slavery, omitting the abject failure of any type of reparations, and completely ignoring the racist violence following the end of the war, “The Civil War” ultimately allowed white Americans to distance themselves from current-day racism and the persistent (and worsening) racial wealth gap. It pardoned sinners who had never asked for pardon; it erased the sadistic violence of the era that still has yet to be fully exposed; it made it all, somehow, feel worth it. Earlier this month, though, with the airing of “Reconstruction” on PBS, Americans got to see what a documentary written and produced by, and featuring, a diverse cast of historians could do to reframe the dominant narrative. Viewers learned basic facts about the era which were not— and devastatingly, still are not—taught in textbooks. “Reconstruction” laid a sound and accurate base of political and cultural history upon which other filmmakers will surely build. Unfortunately, it seems as if “The Civil War” will not hold up against historical scrutiny as well as “Reconstruction” likely will. As Eric Foner opined in his critique of “The Civil War,” “Faced with the choice between historical illumination or nostalgia, Burns consistently opts for nostalgia.” As we’ve seen in “Reconstruction,” historical reality, no matter how painful and violent and vivid, can be effectively and evocatively portrayed though documentary film. On December 5, 1937, bar owner Joe Russell faced an increase in rent. From three dollars a week to a whopping four bucks. Lucky for Joe, the former Victoria Restaurant owned by one Juan Farto (I didn’t make that up), was available. That night, everyone in the place picked up his drink, and his chair, and “moved the bar” across the street. None other than Ernest Hemingway pitched in, (yeah, That Ernest Hemingway), helping himself to the urinal. “I’ve pissed enough of my money into this thing to pay for it‘, bringing the thing home to his wife Pauline, who converted it to a fountain. The peacocks who once roamed “Papa” Hemingway’s yard are gone now but the fountain’s still there, not far from “Sloppy Joe’s Bar” on the corner of Greene and Duval Street. 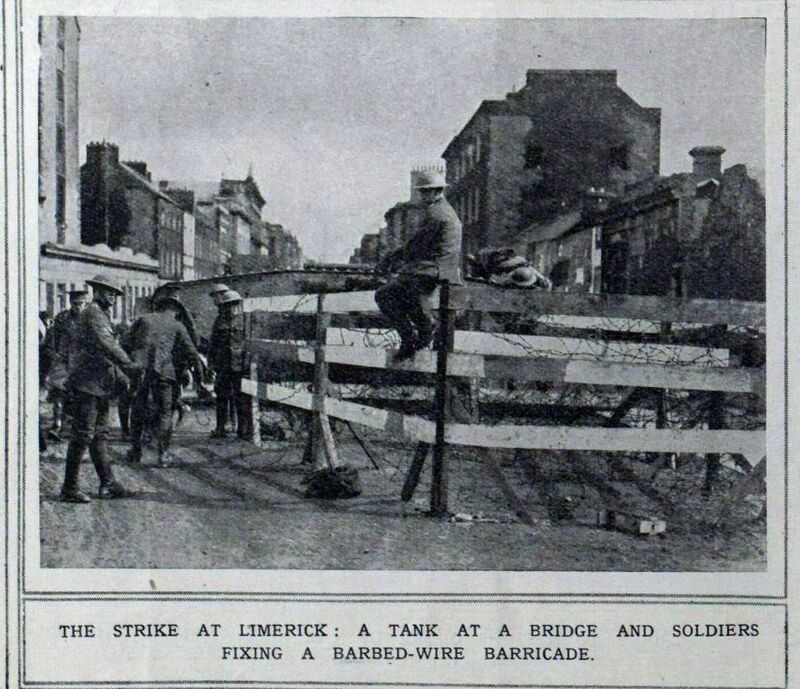 15/4/1919 The Limerick Soviet: dawn of an Irish socialist revolution? Ireland is in an increasingly restive state. In Dublin through Dáil Éireann, the self-declared national parliament, Sinn Féin members are attempting create the trappings of an independent nation. Meanwhile a military campaign is building as members of the Irish Volunteers (now increasingly known as the Irish Republican Army) attempt to seize arms and carry out attacks on British forces. The political and military campaigns operate in tandem, with some of the leading Sinn Féin members also being involved in directing IRA operations. CARNAGE AT CLONTARF: IRELAND’S DARKEST DAY! On Good Friday, April 23, 1014 just north of Dublin a momentous and bloody battle was fought. At stake was the nascent unification of the island under its first true king, Brian Boru; and the future influence of the Vikings, who had settled and meddled in Ireland for nearly two centuries. The battle that resulted changed the course of Irish history forever! The Vikings first began raiding Ireland in the late 8th century. As throughout western Europe, longships crammed with veteran warriors bent on rapine and plunder descended on the coastal settlements and raided deep into the countryside, bringing death and destruction to the unwary inhabitants. The recently established Bavarian Soviet Republic is led by Ernst Toller and a raft of bohemian radicals from the Independent Social Democrats and various anarchist groups. The new regime has established itself in Munich and surrounding areas, forcing the parliamentary government of Johannes Hoffmann to flee to the north of Bavaria. In Paris the leading Allies have finally managed to reach an agreement among themselves regarding Germany’s western frontiers. The provinces of Alsace and Lorraine, lost in 1870, will be formally returned to French rule (they have been under French occupation since the armistice and their return to France was taken for granted). Foch‘s proposal to turn the Rhineland into a buffer state or a French protectorate has failed to gain traction, but the Allies have agreed that they will occupy it for 15 years, after which it will be permanently demilitarised.